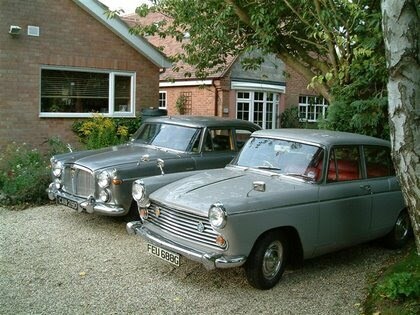 Morris Oxford – a mid life crisis? My first memories of the Farina range go way back to the 1960’s when as a snotty nosed kid I recall my father having a blue Morris Oxford – a new one too as he had a range of company cars in those days. After I passed my driving test in 1980, I must admit I never went near any BMC products – instead placing my faith in a variety of Fords ranging from tatty Mk 2 Cortinas to Ford Granadas. I did have a nice 1959 Singer Gazelle in the summer of 1986 (column change and red leather too) plus an interesting experience owning a 1974 Pontiac Firebird which did 12mpg and handled like a bucket of ………. Enough said I think. In the late 80’s I had a job that provided a company car and I lost interest in cars generally as I was working in the transport industry anyway. I dipped out of the rat race for a while in the 90’s and went travelling spending a lot of time in the US, New Zealand & Australia. Here I owned a variety of cars as I figured this was a far cheaper way of getting around. 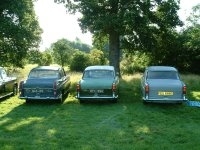 The cars ranged from Ford Escorts, Holden Kingswoods through to an old Buick Skylark. Coming back to the UK and totally skint I ran a variety of bangers before getting a ‘proper job’ and upgrading to used cars that were normally just a year old. Very reliable and ultra modern etc, but something was missing – driving was no fun! In November 2004, a mate had just bought himself his first property. It came with a lock up in a block around the corner and we discovered a Morris Oxford that had been in there since 1986. As I live just 6 miles or so from the Cowley plant where the Oxford’s were built I just had to have it. The old boy that sold the property had gone into a nursing home and the car was part of the property. I was given the car as the garage was due for fairly quick demolition. This is the car being towed away from its home of 18 years. KRO 712C then spent most of the next 2 years in a barn and then a mate’s garage. She was a non-runner – everything seized of course and a fair bit of rust but she’d never been welded underneath which made her quite special. The old boy that had owned her had put plenty of underseal / old oil under her frame, which kept the floor, sound. Today she is back either on my drive or in my garage. Awaiting restoration is probably the best description but the motor is now running and I’ve plans to get this one back on the road but it will a fair while in all honesty. KRO 712C sort of whetted the appetite somewhat and I had to have a runner to play with in the meantime. 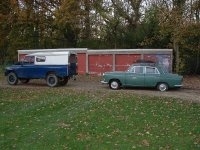 In August 2005, I did a daft thing and bid on a 1962 Morris Oxford on Ebay. Of course I won the car but at £250 and only 40 miles down the road I was pretty relaxed about it. I picked her up after having got used to a very loose column change (which I absolutely loved in the end and wished my other Oxfords had it). EFC 135A was a dog though – just a bit of fun but a serious restoration project for someone. 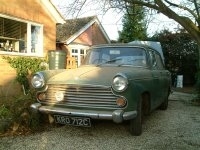 I ran her most weekends until May 2006 when I put her back on Ebay because I had acquired another Morris Oxford by then. EFC 135A went off for slightly more than I paid for her and to someone local who like me has a bit of a passion for old BMC Farinas. I’ve kept in touch and EFC 135A is being slowly restored and is still a runner. In February 2006, I had another spree on Ebay but this time I went to see the car in question as it was going to be a bit more money. 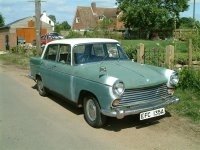 FEU 688G was a very low mileage Morris Oxford with 3 previous owners and lots of history & parts. She needed some welding but not immediately – indeed she was good enough to show if you weren’t too fussy. So I won that bid too and drove her back from Cambridgeshire to Oxford with no problem apart from a slight slipping clutch. Given that there was thick freezing fog for most of the journey, I was certainly impressed with this one. FEU 688G was given a good service, new clutch and brakes and then was driven around in the summer of 2006 to several shows and odd day trips. I started collecting various panels I found either on Ebay or rallies (I can recommend the BMC spares rally held at Peterborough in early August). Other panels were sourced from NTG after I discovered the tinworm was far more extensive than I had imagined. (Inner sills, outriggers, various wing parts, boot lid and valence) I then found a welder to weld all the panels on and as of May 2007 – she’s still being sorted and then I have to arrange a paint job too. Hopefully she’ll be ready for a summer of fun. At least it gives me time to tinker with KRO 712C. When I say tinker I mean play with it, as I’m not the world’s best mechanic but Farina’s are good to learn on. 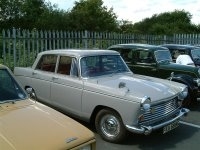 I’ll update the story as it unfolds as I’m dead keen on getting a Westminster having just sold my Rover P5! FEU 688G has had her rust seen too - well most of it I think! Inner & outer sills plus various other bits like wings etc. These pictures shows her with works in progress this May. The new offside wing was a real bargain - bought at last years BMC rally in Peterborough for £120. Saves messing about with all those repair panels. The old wing wasn't wasted, it was used up on a banger race Oxford - which survived its first race very well - must be my lucky wing! 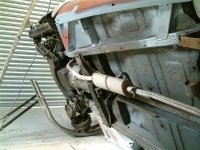 Other repairs were quite tricky at times and tested the skills of the welder I used. After all the body repairs, my original plan to get away with a few resprayed panels clearly wasn't going to work, so I ended up having a full respray which took care of the money I got from selling my Rover P5. I saved a little by not doing the inner door metal or engine bay, under boot lid and by keeping the glass in. You never get a spot on finish by keeping the screens in but I didn't want the hassle of refitting them. The interior trim took a right battering with all this going on and it's only today in August as I write this that I've finished glueing the trim bits and replacing the door felts. 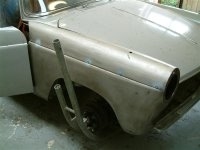 Next big job will be the rear springs - I've got all the bits and am awaiting the use of a ramp to complete the job. I suspect that all my front suspension bushes will be up for some attention soon and then there's the carb............... never ending is it? She has been to a couple of shows - would have been a couple more on top of that but for the floods which got us down here in Oxford too. 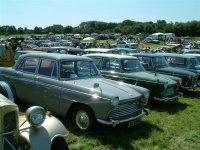 First show was a Morris car rally in Oxford. Not a huge attendance and I suspect that was partially down to the timing which clashed with some other local rallies. Second show was the big BMC rally held in Ferry Meadows, Peterborough on the first weekend of August. I really recommend this one as it's probably the largest gathering of Farinas you'll ever see. I reckon there were easily 50 or so this time. COOC had a large stand here but as I travelled up with 2 other cars whose owners weren't club members, I left my car in the 60's general section. 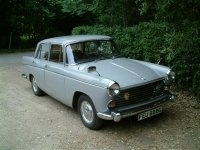 EFC 135A was a former car of mine - and I kept in touch with the new owner who has done her up and we both went to Peterborough accompanied by his partner in a rare MK 3 Magnette. Travelling in convoy certainly got us a few glances from the drivers and passengers of boring euro boxes that seem to fill our roads these days. Despite the hot weather, no overheating problems were experienced though I stuck my heater on occasionally which seems to help keep the temperature needle down a notch. If anyone is interested in Peterborough BMC rally August 2008 - let me know and I'll get details out to you. I camped there this time which was great with the sunny hot weather. As for KRO 712C - no real change from my first ramblings and I suspect I'll have to let her go. After spending so much time and cash on FEU 688G, I don't think I can go for another restoration quite so soon. It would be far cheaper to hold out and buy something already done up. Restoration works cost a fortune even if you do most of the hard work. Hopefully I can prevent her from going on the banger circuit.